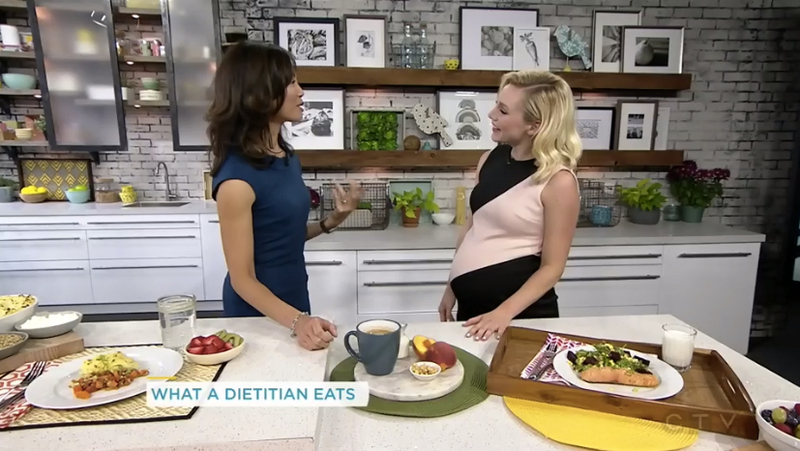 As one of my monthly segments on CTV Your Morning, I thought it would be fun to do a little show and tell of my meals in a day. 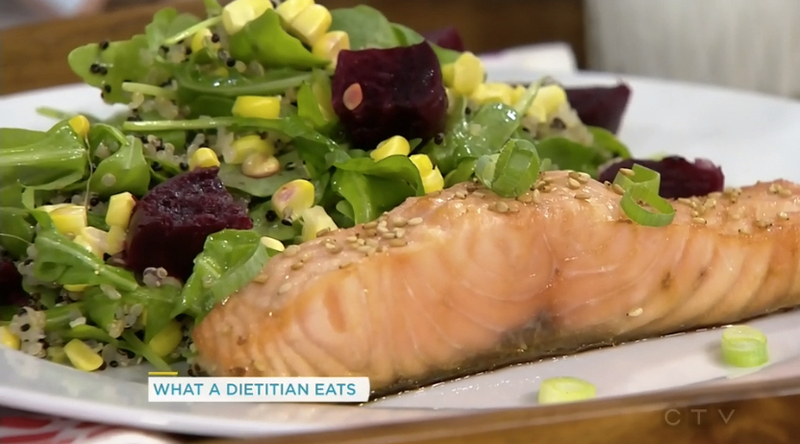 So here we go…this is what a dietitian eats! 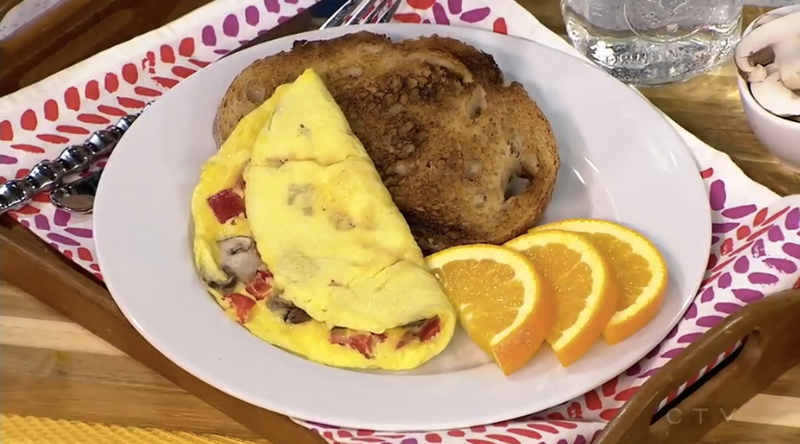 For breakfast, I try to make sure that I’m getting protein and veggies, so an omelet is perfect! Eggs are a great source of protein and the egg yolk is filled with nutrients such as lutein, omega-3 fat and choline. I add a slice of whole wheat toast for wholesome carbs and fibre. If I know my morning will be super busy, then I’ll make the omelet the night before and just heat it up in the morning for a quick breakfast. I love lentils! This is a fantastic vegetarian, plant-based lunch and a lighter version of your typical Shepherd’s Pie. Find the recipe here. Again, I’m looking for protein and veggies in my meal – lentils provide the protein and iron; carrots and stewed tomatoes count towards my veggies. 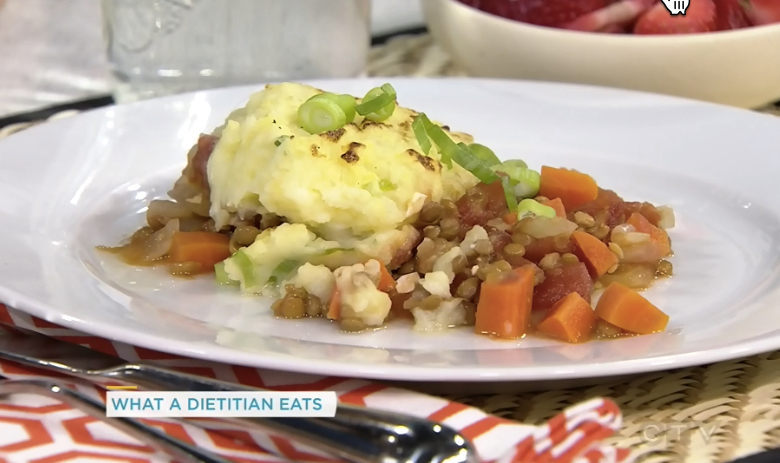 The mashed potato topping is actually mixed with some cottage cheese to boost the calcium count. I pair this meal with some fresh fruit such as strawberries and kiwi – the vitamin C in the fruit improves the iron absorption from the lentils. My plan is to make this recipe on the weekend and re-heat it for a fast and nutrition packed lunch. My mornings start at 6 am, so by mid afternoon, I’m feeling like I need an energy boost. A little bit of caffeine and some protein help me stay alert. Coffee is a treat for me – with double cream and double sugar! 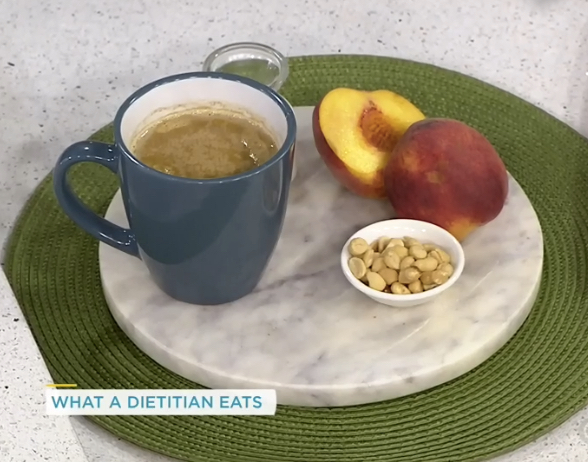 I aim to eat at least one green veggie and at least one orange veggie or fruit every day – I’m choosing a peach which is in season now. Peanuts are great for protein and they also contain magnesium which helps to fight stress. I try to eat fish at least twice a week. Salmon is my go-to for heart healthy omega-3 fats, and it’s super easy to cook in the toaster oven. This is an Asian inspired recipe with a soy sauce and sesame oil marinade. I make a batch of quinoa ahead of time and use it in different ways throughout the week. Here, I’ve tossed some quinoa with arugula and added in some roasted beets and corn kernels. I set a goal to include at least 2 types of veggies at dinner time and make half my plate veggies. I usually have fresh fruit for dessert. Sometimes I’ll pair the fruit with a piece of dark chocolate. I love to bake, and never turn down a homemade cookie or slice of apple pie with ice cream! A study by researchers at the University of British Columbia found that Canadian children are not eating enough vegetables and fruit during the school day. The first of its kind, this study looked at 4,827 children across Canada between the ages of six and 17. 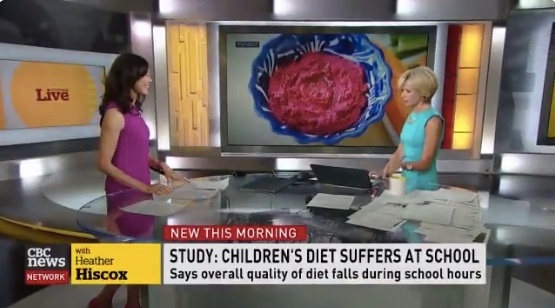 Using a 24 hour recall, their dietary intakes from 9 am to 2 pm was scored against a School Healthy Eating Index. The Index looks at 11 specific criteria based on Canada’s Food Guide’s recommendations, such as intake of vegetables and fruit, whole grains, milk products and meat and alternatives. 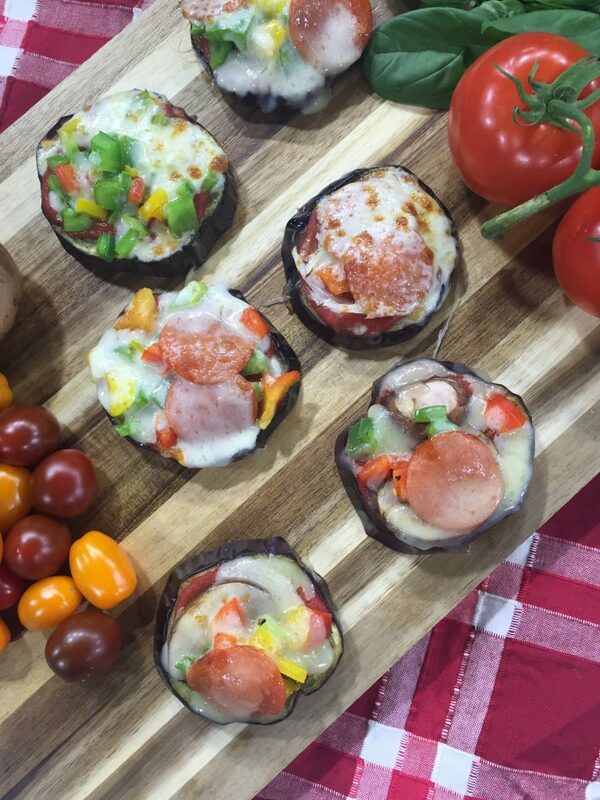 Here are a few of my lunch ideas, as shown on my interview with CBC Morning Live today. 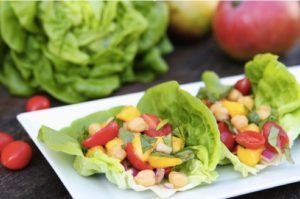 Chickpea Lettuce Wrap – Kids are attracted to colours in their meals! A great protein packed and flavourful recipe! Add a glass of milk or fortified soy beverage to round out the meal. 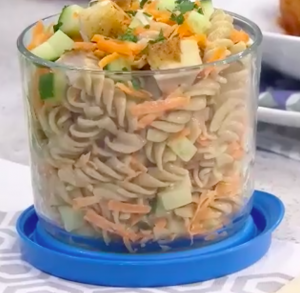 Chicken Pasta Salad – My daughter won 3rd prize in a recipe contest for this recipe when she was in grade 3. Ask your kids to grate the carrots and chop the cucumbers. Balance the lunch with a serving of yogurt. 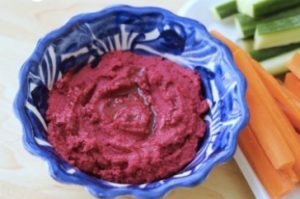 Beet Hummus with Veggies – Kids love to dip! 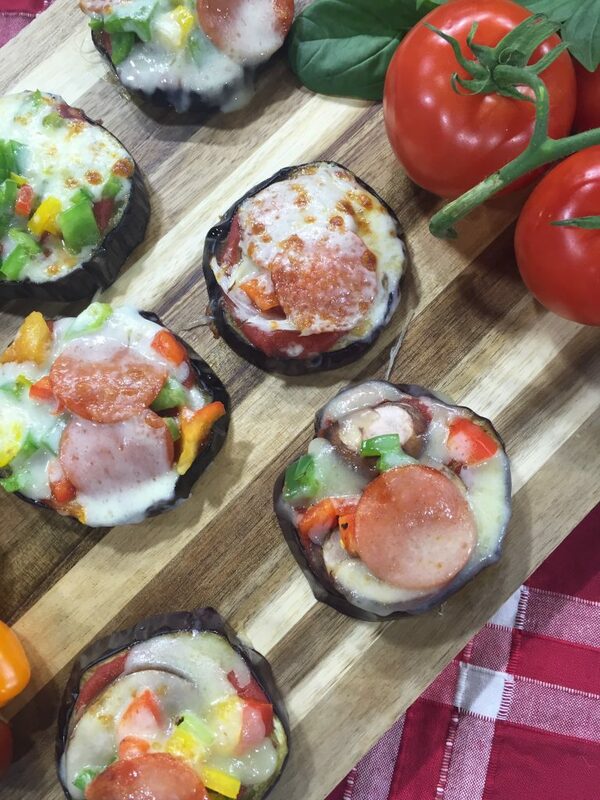 A great way to team up protein plus produce in the lunchbox! Add mini pitas with cheese cubes for a nutritious lunch. Apple Sailboats – It’s as easy as it looks! Slice an apple into wedges and dip in lemon juice to prevent browning. Cut cheese into triangles and attach with a toothpick. Add a handful of whole grain crackers to complete the meal. Zucchini Waffles – Breakfast for lunch, why not? These waffles are made with grated zucchini. (Sneak in the veggies wherever you can!) Add a hard cooked egg or small piece of cooked meat / poultry for protein. Mix a few extra berries with yogurt for “dessert”. YOU can Help Shape Canada’s Nutrition Policies! Are you concerned about marketing to kids? Do you want Canada’s Food Guide to be the best tool to help you and your families eat well? Are you interested in access to safe and healthy food as well as the relationship between agriculture, the environment and the economy? If you answered YES to any of these questions, then please take some time to complete Health Canada’s free online consultations on these three issues. Don’t miss your chance to have your voice heard! Health Canada wants to reduce how much advertising children see or hear about unhealthy food and beverages. This online consultation is the first step to more consultations coming in 2018. Your ideas and opinions will help Health Canada decide how to go about restricting advertising for unhealthy food and beverages to children. Here is the online consultation survey. Survey closes on July 25, 2017. This is phase 2 of the consultations. After this consultation, Health Canada will create recommendations and develop them into consumer messages, tools, and resources. A new suite of Canada’s Food Guide resources will be rolled out beginning in early 2018. A food policy is a way to address issues related to the production, processing, distribution and consumption of food. The decisions we make as individuals and as a country about food have a direct impact on our health, environment, economy, and communities. Here is the online survey. Survey closes on July 27, 2017. Do you find it challenging to eat enough veggies? 60% of Canadian adults and 70% of kids aren’t getting enough fruit or veggies every day. 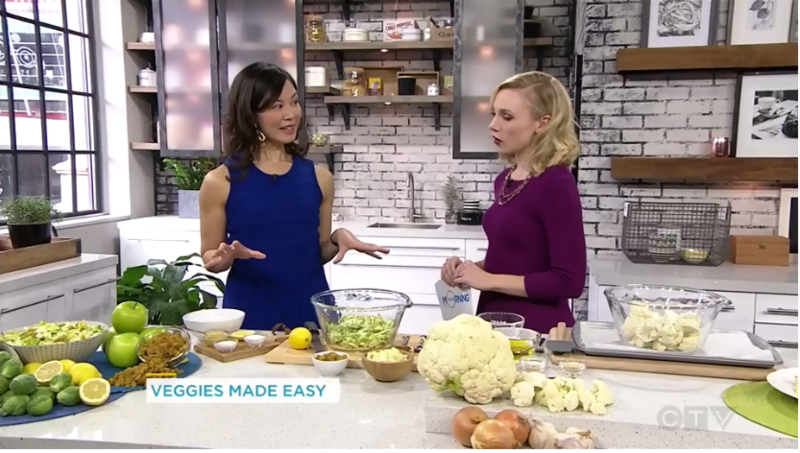 Let’s take 3 different veggies and make 3 super easy recipes: Brussels Sprouts Salad, Cauliflower Popcorn, and Eggplant Pizza! Watch my TV interview clip. 1. Whisk the mayonnaise with mustard, lemon zest, juice, sugar and salt. Whisk the oil in slowly. 2. 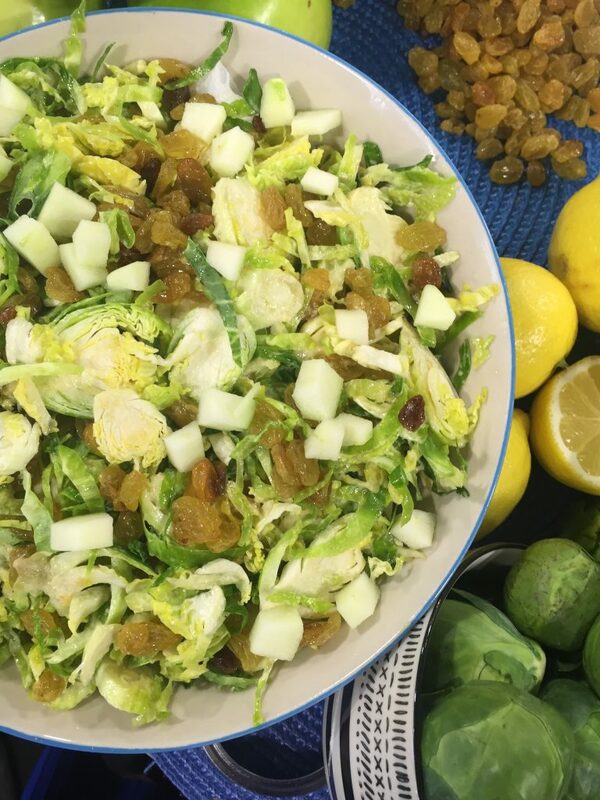 Combine the Shaved Brussels Sprouts, apple and golden raisin and toss with the dressing. 3. May be served right away or refrigerated until serving. 1. In a small bowl, mix the olive oil with the spices. 2. Pour oil mixture over cauliflower and toss to coat. 3. 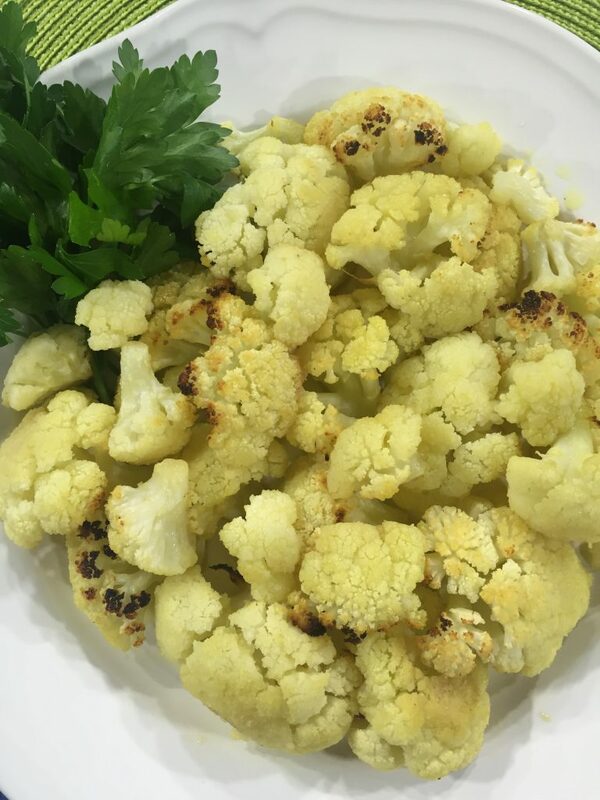 Spread the cauliflower in a single layer on a parchment-lined baking sheet. 4. Bake at 450°F for 35-45 minutes or until golden brown and slightly crispy. 1. Preheat oven to 425°F, coat parchment lined baking sheet with olive oil. 2. Arrange eggplant on sheet and flip to evenly coat with olive oil. Sprinkle with salt and pepper and roast for 15-20 minutes. 3. Once time has elapsed, flip and season, return to oven for an additional 10 minutes. 4. Remove from oven, top with pizza sauce, veggies of your choice, and mozzarella cheese. Return to oven for about 10 minutes or until cheese is bubbly. The Centre for Mindful Eating has declared January 28, 2106 as the first international Mindful Eating Day! Here are my tips for eating mindfully today and every day! 1. Listen to your hunger cues. We’ve all turned to food when we were feeling stressed, bored, lonely or upset. Mindful eating encourages us to ask ourselves if we are truly hungry before we automatically reach for a snack or meal. 2. Listen to your fullness cues. My general rule of thumb is to eat until you’re about 80% full. What does 80% feel like? Well, you’re not stuffed and you don’t have to loosen your belt. But at the same time, you’re not hungry anymore. 3. Eat with all of your senses. Can you taste the natural sweetness of those roasted carrots, or the hint of ginger in the butternut squash soup? Savour the flavours, colours, sounds and textures of every meal. 4. Plate it. Put your food on a plate or in a bowl, even if it’s two cookies or a handful of grapes. That way, you’ll have a good sense of your portions which is tricky to do if you’re eating straight out of the cookie bag. 5. Take your time and enjoy! Eating is one of life’s greatest joys, so don’t rush it. Sit down, relax and enjoy each bite! 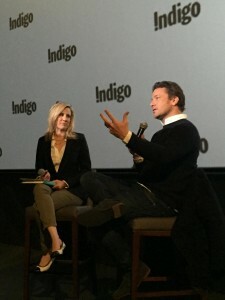 ICYMI, Jamie Oliver was in Toronto on October 28th to launch his new TV show on Food Network Canada and his new cookbook Everyday Super Food. 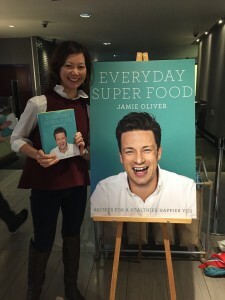 I was there at the TV show prescreening and had a chance to listen to Chef Jamie’s thoughts on his latest cookbook. Feeling sleepy after your Thanksgiving meal? Don’t blame it all on the turkey. Like all protein-containing foods, turkey is made up of amino acids. The amino acid of particular interest in turkey is called tryptophan. Tryptophan is a component of serotonin which is a neurotransmitter that helps us feel calm and relaxed. Serotonin is also used to make the sleep-inducing hormone called melatonin. As we digest foods containing protein, the amino acids enter the bloodstream and make their way over to the brain. The problem is that tryptophan is a big, bulky amino acid. So it has to compete with other amino acids to get into the brain. Imagine this as a long lineup of people waiting to get into a concert. Enter carbs. The carbs you eat from the stuffing, mashed potatoes, pumpkin pie and other typical Thanksgiving fare stuffing actually triggers the release of insulin. This action removes most of the amino acids from our bloodstream, but not the tryptophan. It’s as if all of the people in line for that concert have been pulled away, except for tryptophan. This of course makes it easier for tryptophan to enter the brain and start it’s effect on serotonin and melatonin to create that sleepy effect. So if you’d like to avoid the ZZZ’s after your Thanksgiving meal, try to ease up on the servings of carbs on your dinner plate. It doesn’t hurt to go easy on the alcohol too. 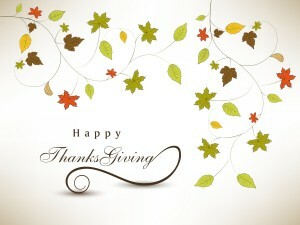 Otherwise, grab a pillow for a Thanksgiving ticket to nap land! Back to School Routine…with a Teen! Well, we’re finally settled into a new schedule that’s packed with school team practices, extra curricular lessons, and after school clubs. Now that my kids are teens, I’ve learned a few things and have had to adjust my eating plan for them. 1. My teens go to sleep late. What’s happening is a change in their melatonin which is a hormone that regulates the wake-sleep cycle. In young kids, melatonin is released early in the evening, triggering an early bedtime. In adolescents however, the melatonin isn’t released until 9 pm or even 10 pm, meaning that my teens aren’t feeling sleepy until at least 11 pm. The food fix: Keep plenty of grab-‘n-go foods in the kitchen. With dinner typically at 6 pm, my teens are often hungry for a snack around 9:30 or 10 pm. By creating an environment of healthy food choices such as bagels, tortilla chips, grated cheese, yogurt, fresh cooked meat, fresh fruit and fresh veggies, they can make their own smart snacks while I’m catching my ZZZs. 2. Teens like to sleep in. This is a corollary to lesson #1 above! My teens might have only have 15-20 minutes on a weekday to get up, eat breakfast, change, groom themselves, print out their homework assignment, pack their bags, text their friends, slap on some sunscreen, and then finally jump out the door. 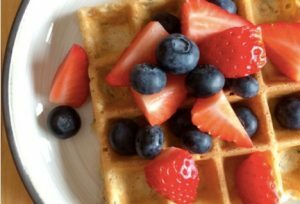 The food fix: Keep it simple in the morning. 20 minutes is definitely doable in the mornings, but to keep things moving along, we focus on easy to eat, protein-filled breakfast options. Some of their favourites are Greek yogurt smoothies, fresh fruit, grilled cheese sandwiches and eggs. 3. Teens can have changing lunch times. Last year,my daughter’s lunch period was at 12:45 pm. This term, it’s at 11:15 am. Next term, her lunch period switches to 12:15 pm. 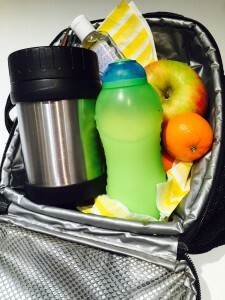 The food fix: Pack a snack.To ensure that she’s hungry for her early lunch, we try not to have an overly big breakfast. By the time 3:30 rolls around though, she’s absolutely starving, so we pack a little something extra in her lunch bag for those after school munchies. 4. Teens like to buy their lunch. Like all teens, my crew is becoming quite independent and enjoys the freedom to buy their lunch from the school cafeteria or nearby quick service restaurant. The food fix: We follow the 80-20 rule. On most days of the week, my teens will bring a packed lunch to school. Once a week, they buy their lunch. We talk about healthy choices and money sense. But I never judge them on their choices. I do however, sneak in an extra fruit or veggie at breakfast and suppertime! 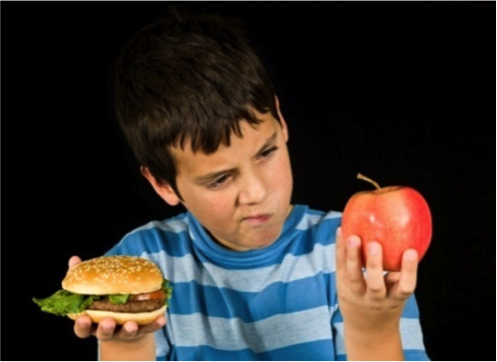 Will we solve the obesity crisis by simply telling people to “eat less and eat better”? 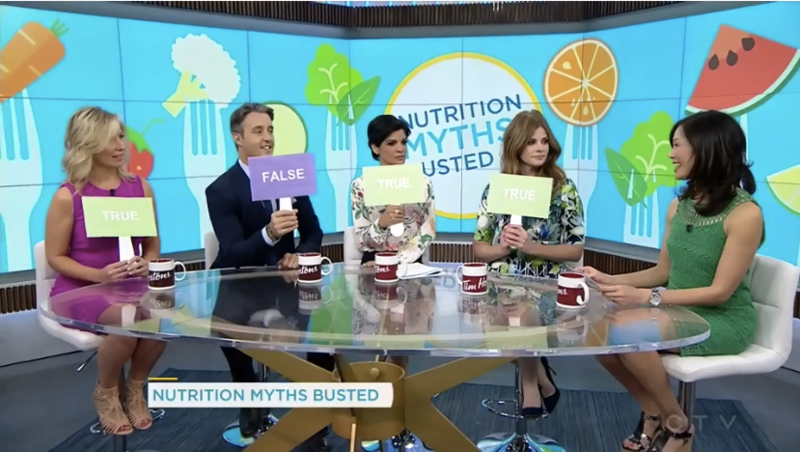 A one-day health professional forum was held in Toronto to rethink our messages about food and obesity. The event featured key leaders in obesity research/treatment and health communications: Dr. Ayra Sharma, Ted Kyle and me! Here’s what the experts were saying. •	Obesity is a complex chronic disease. •	Simplistic messages about obesity are misleading, can promote unhealthy weight obsession and promote bias and discrimination. •	Prevention and intervention strategies should focus on improving health behaviours rather than on just changing body weight. •	Use respectful, people-first language that is free of bias and stigma – e.g. “unhealthy weight” or “high BMI” instead of “fat” or “morbidly obese”. •	“Obese” is a harmful label. “Obesity” is a disease. •	Shift the conversation from “being obese” towards health. •	“Eating better” means cooking, eating together and enjoying food. •	Health and nutrition communications needs to be creative to capture consumers’ attention. •	From celebrities and chefs to dietitians and politicians, everyone has a role in being a champion for change.